The simultaneous localization and mapping (SLAM) problem is for a mobile robot to concurrently estimate both a map of its environment and its pose with respect to the map. Most SLAM research relies on accurate — but expensive — sensors such as scanning laser rangefinders. Because of cost and other factors, these sensors are unsuitable for deployment in many applications, e.g., consumer robots, disposable robots for search and rescue or hazardous material detection, or mobile sensor networks. Our research aims to develop algorithms for SLAM on robots with much more limited sensing, such as small arrays of infrared rangefinders. Such sensors cost orders of magnitude less than laser rangefinders and consume less power and computation. However, they give only low-resolution, short-range feedback about the environment and thus are difficult to use for mapping. 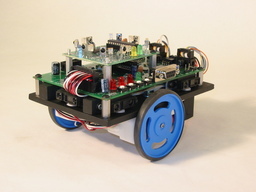 Mapping with an inexpensive robot such as the ARL Ratbot (right) is challenging for several reasons. Most importantly, information about the environment available via the robot's sensors is much more restricted than for robots with scanning laser rangefinders. In particular, it is generally impossible to extract distinctive features of the environment (e.g., lines representing walls or points representing corners) from a sensor scan taken from a single pose. The problem is essentially one of partial observability; similar issues arise with other types of sensors as well, such as sonar sensors or monocular cameras. In order to do mapping with "sparse" (low spatial resolution) range-bearing sensors, it is necessary to extract features using scan data from several robot poses. This in turn leads to increased uncertainty in the map and pose estimates. Our research addresses strategies for SLAM with multi-pose data and ways to improve estimation accuracy in the face of high uncertainty. Algorithms for SLAM based on Rao-Blackwellized particle filtering (RBPF), in which the robot's trajectory estimate is represented by a set of samples, or particles, offer several advantages over other approaches such as extended Kalman filter (EKF) SLAM. Thus, while others have studied the partial observability problem in the context of EKF, our focus has been on RBPF algorithms. In order to extract features from sparse range-bearing data, we group consecutive individual scans from multiple robot poses into "multiscans." After accumulating several scans in a multiscan, feature extraction is then performed as though the data came from a single scan, and a standard SLAM update is applied. Because multiscans contain data taken from multiple robot poses, a straightforward implementation of our approach requires feature extraction to be performed separately for each particle in the filter (particles have unique trajectories). This is a costly proposition. An alternative that we have developed is to extract features using only the expected (mean) trajectory estimate, and then transform the features for each particle. This approach yields sufficient accuracy for SLAM since multiscans are taken over short trajectories. If more accuracy is required, particles can be grouped into "strata," and features can be extracted once for each strata and then transformed. We have implemented our approach and applied it to real-world data from Radish, a SLAM dataset repository. Since our focus is on limited sensing, and most data on Radish is from laser rangefinders, we simply discard readings from all but five sensor orientations before mapping. Our algorithm has successfully built maps like the one shown above, of the Gates Building at Stanford University. 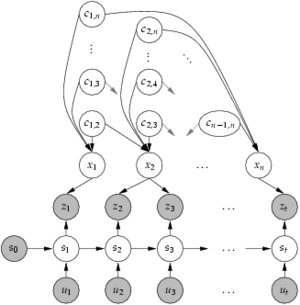 Most algorithms for SLAM do not incorporate prior knowledge of structural or geometrical characteristics of the environment. In some cases, such information is readily available and making some assumptions is reasonable. For example, it is often safe to assume that many walls in an indoor environment are rectilinear. 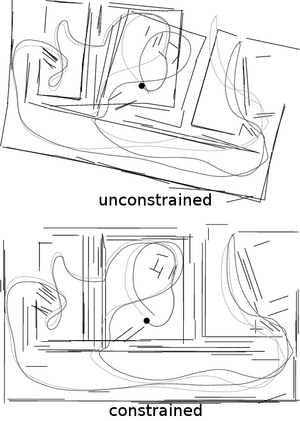 We have developed a SLAM algorithm called the "Rao-Blackwellized constraint filter" that incorporates prior knowledge of relative constraints between landmarks in a map. The filter infers applicable constraints and efficiently enforces them in a framework similar to RBPF SLAM. In contrast, other work has studied relative constraints only in the context of EKF-SLAM; furthermore, to our knowledge, our research is the first to take a principled approach to inferring when constraints should be applied. A key component of our approach is a recognition that the typical RBPF SLAM model assumes the environment is unstructured, i.e., that landmarks are randomly and independently distributed in the workspace. In fact, this is rarely the case, as in indoor environments where landmarks are placed methodically by an architect. Thus, some correlation exists between landmarks, breaking the traditional RBPF model. However, prior knowledge of this correlation can be exploited to infer the relationships between landmarks. We have implemented our approach with rectilinearity constraints. Our algorithm deduces which line landmarks are parallel and which are orthogonal, and then enforces these constraints during RBPF SLAM. Our results show the algorithm leads to improvements in filter consistency over basic RBPF. Furthermore, by incorporating prior knowledge about landmark relationships, the number of particles required by the filter is dramatically reduced. For sparse sensing SLAM, we have been able to produce real-world maps of large environments with loops using as few as 20 particles — on par with state-of-the-art SLAM algorithms that use expensive laser rangefinders. Implementing versions of our SLAM algorithms on-board real inexpensive robot hardware (e.g., the ARL Ratbots) with extremely limited computing and storage capabilities.